The Flower Loop Hairpin frame is one of my favorite crochet tools. It makes lovely two and three row ruffles at one time. It is also a way to get motifs without cutting the yarn. Each motif is crocheted only halfway before moving to the next. They are finished after the last motif of the row is done by turning and going back to the beginning. It gets more complicated with triangular shapes, but the basic principle is the same. 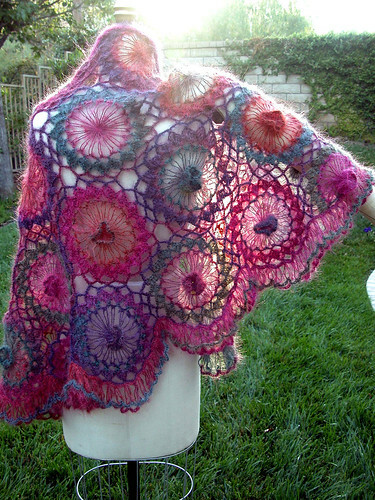 This entry was posted on Saturday, October 25th, 2008 at 12:36 pm and is filed under Crochet and Lace. Tagged: Crochet, Hairpin lace, Shawl. You can feed this entry. You can leave a response, or trackback from your own site.